Today’s streets are contested spaces. There seems to be an ongoing, intensifying competition between cars, bikes and pedestrians, trying to get from point A to B as quickly as possible. How do they all share the limited space available in cities? 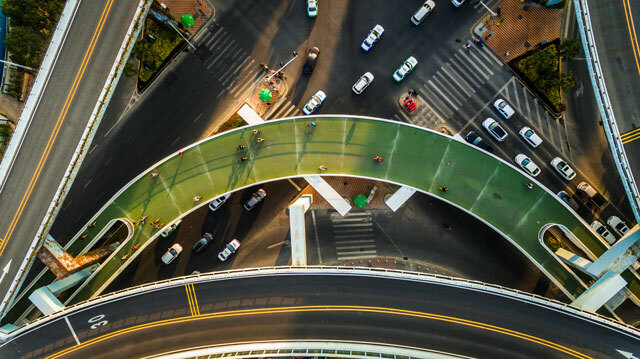 In the southern Chinese city of Xiamen, a visionary solution to the problem is the Bike Skyway, which enables cyclists to literally soar over cars and pedestrians on the street below. 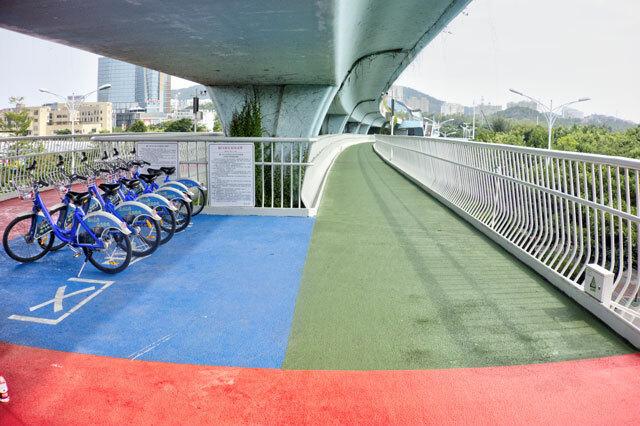 Joining the city’s swooping highway overpasses is the world’s longest elevated bike path. At 7.6 kilometers (4.7 miles) in length and rising five meters (16 feet) above the ground, the Bike Skyway enables cyclists to safely and efficiently traverse the dense core of this city of 4 million people. 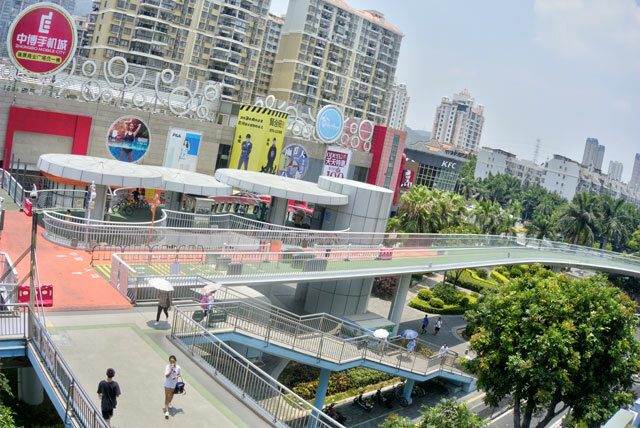 The skyway runs in a straight line, parallel to the city’s raised bus rapid transit system, with regularly spaced rest areas and multiple access points to reach local businesses, shops and restaurants. The Bike Skyway was designed by the same Danish architectural firm, DISSING+WEITLING, that built Copenhagen’s famous “snake” bike overpass in 2014. In addition to visiting and riding on the Xiamen Bike Skyway this past summer, I recently had the opportunity to interview Steen Savery Trojaborg, managing director of DISSING+WEITLING. Imagine a busy stretch of road with several lanes of traffic divided by islands. Then picture using those islands as the foundation on which to build a bike skyway as an alternative to bike lanes along that stretch. The safety aspect alone makes it worth considering. “When I was first riding my bike [along the Bike Skyway] I heard honking and I would immediately adjust or look for where the cars were. But then I had to tell myself there were three floors below,” says Trojaborg. The network also has a 1.4-meter safety railing running along its edges. When it first opened in 2017, it wasn’t long before the Bike Skyway reached its maximum number of 2,000 riders per hour and 24,000 daily. Since the initial novelty has worn off, those numbers have decreased to about 4,000 riders per day. Unlike bike-crazy cities like Copenhagen, where the bike lanes are jammed during the week and relatively quiet on weekends, Trojaborg says it’s the opposite in Xiamen. Most users are tourists and weekend explorers, rather than people going to work. Over time, as more and more residents got accustomed to riding bikes, communities gradually buy into the idea of establishing additional biking infrastructure. “That’s how you reclaim the city,” says Trojaborg. Mark Wessel is a writer and public speaker who profiles sustainability initiatives that other communities can learn from. His articles have appeared in Next City, Municipal World, Cities Today, Urban Future and selected Postmedia newspapers.